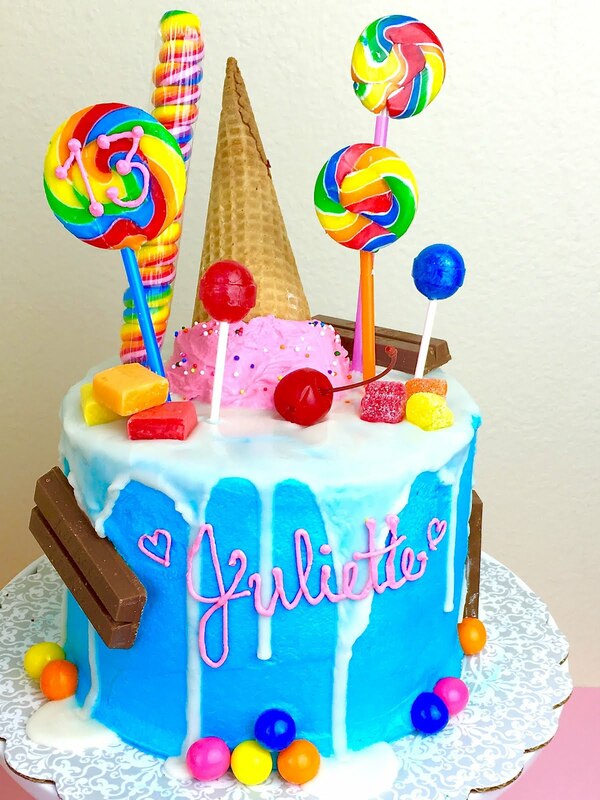 Cotton candy cake layers, frosted in a bubblegum frosting, topped with lollipops, more candy and a frosting ice cream cone! 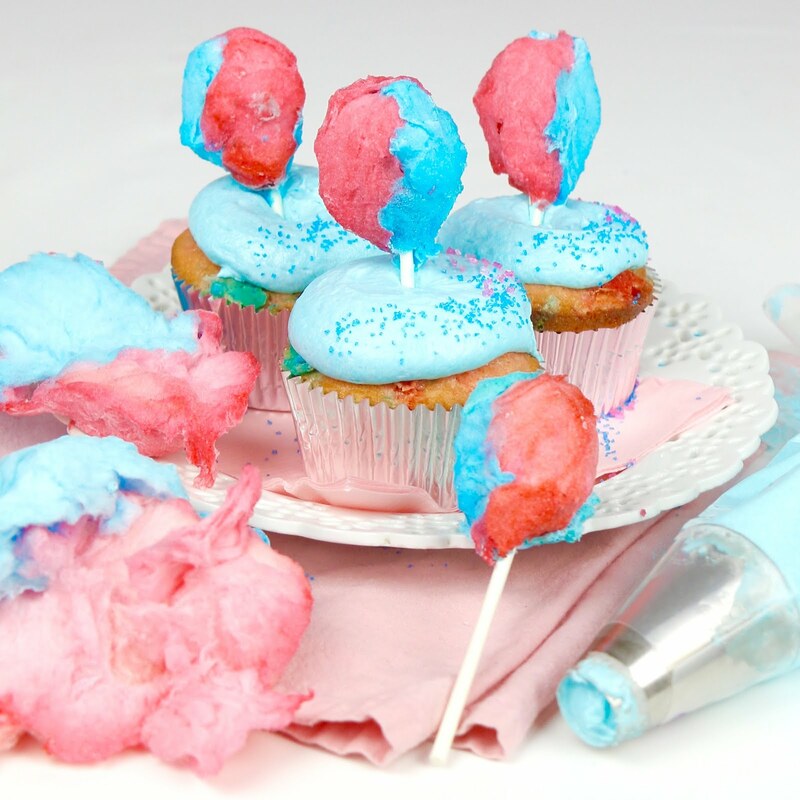 My favorite part is the sweet, creamy, melt-in-your-mouth bubblegum frosting! 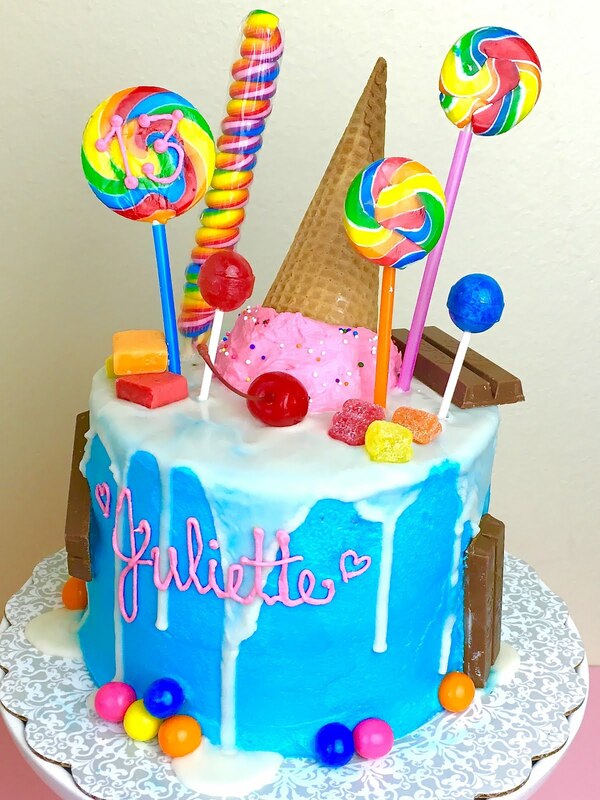 Frost, glaze and top with candy galore. 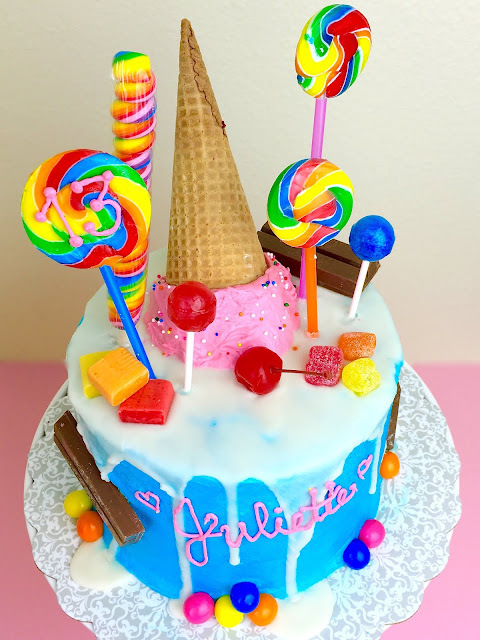 I placed the lollipop sticks into a straw to skewer them into the cake and topped it with an ice cream cone stuffed with frosting. Preheat oven to 350° F. Grease two 8" round cake pans. In a small bowl, whisk together egg, vanilla, and sour cream. Slowly pour in 2/3 of the wet mixture and beat on medium speed for about 1-2 minutes, until smooth. Scrape down bottom and sides of bowl. Beat in remaining wet mixture and beat for about 30 more seconds until fully incorporated. Break cotton candy into small chunks and beat in to batter until just incorporated. 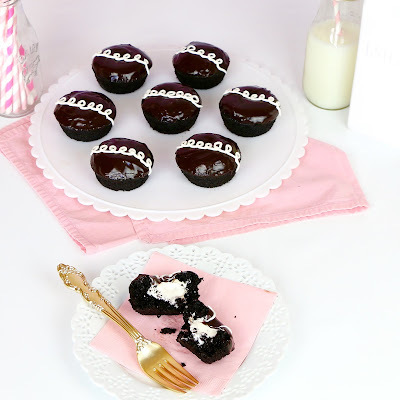 Distribute the batter between the prepared cake pans. Bake 25 to 35 minutes*, or until a toothpick inserted in the center comes out clean. Cool slightly in pans for about 5 minutes, before transferring to a wire rack to cool completely. Let cool before frosting. With an electric mixer, beat butter on medium-high speed until smooth and pale in color, about 2-3 minutes. On low speed, beat in vanilla, bubblegum flavor and salt. 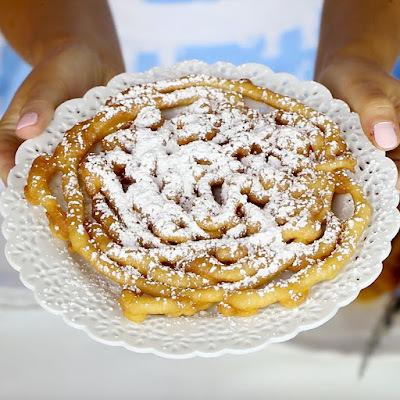 Slowly beat in powdered sugar, about a half cup at a time. 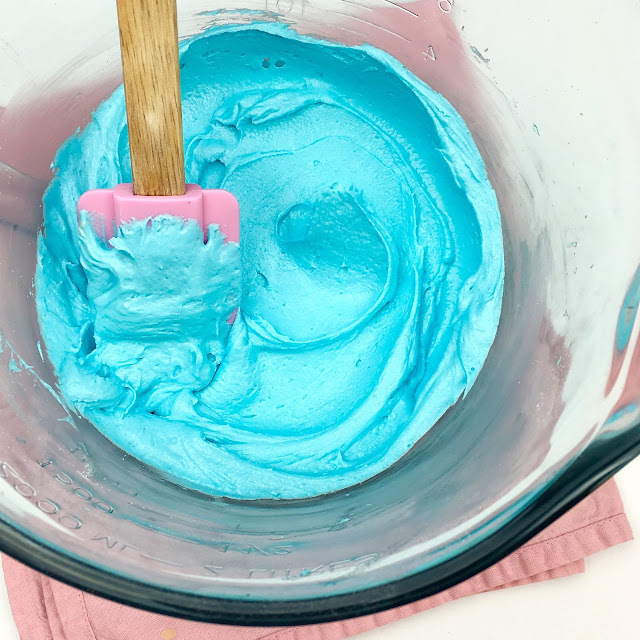 Add cotton cream and a few drops of blue food coloring (reserving some frosting to color pink for faux ice cream cone). Increase speed to medium-high and beat for about 3-5 minutes until smooth, light and fluffy. Frost completely cooled cakes, . Stir together all ingredients in a small bowl, adding liquid very slowly until desired consistency is reached. If glaze starts to thicken you can microwave it for a few seconds to thin it out again. Pour over top of cake, using a spatula to push glaze to the edge, so it drips down. 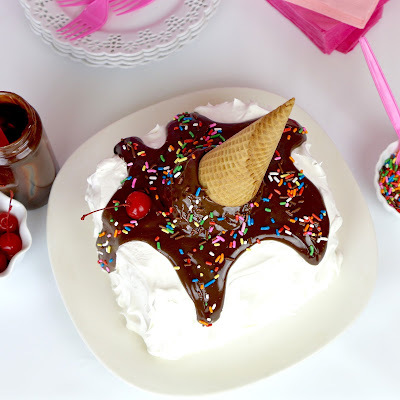 Top with faux ice cream cone and candy. Place lollipop sticks into a straw and skewer into cake. 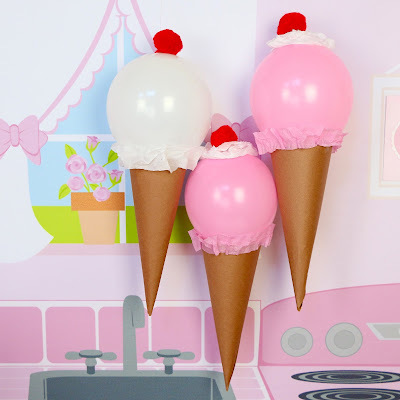 WANT MORE FUN PARTY TREATS? !